For those who enjoy walking though, it is great fun to explore the hutongs on foot. Nanluoguxiang is an 800-meter long alley lined with cool cafes, bars and curio shops. 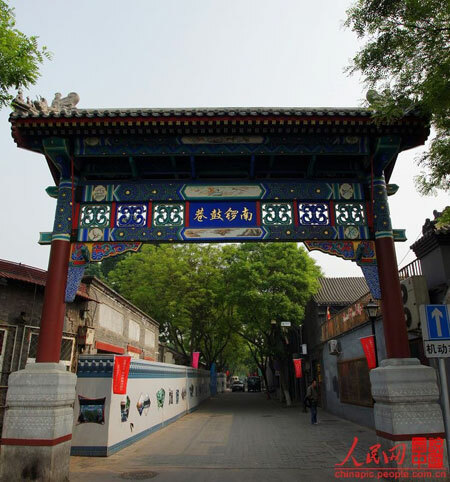 For the foreigners in Beijing, Nanluoguxiang is a fusion of old and new Beijing and the one they can get their tongue around the hutong's name. Nanluoguxiang is one of the oldest neighborhoods of Beijing that withholds the most complete quadrangle courtyard (Sihe Yuan). Since the Ming Dynasty (1368-1644), it has been the so-called "rich zone" with residences of senior officials, ultra-rich businessmen and celebrities. Nanluoguxiang not only survives hutong demolition but also attracts business opportunities. Stylish café and shops’ along the alley marks the rebirth of the hutong, where the old and new mixed. Tourists from all over the world love to come here to get “Lost in Beijing”. Nanluoguxiang stretches about 800 meters south-north, with eight hutongs on the each side. Today, bars have sprung up in this old street, making it yet another bar street following the ones at Sanlitun and Shishahai. With its unique cultural connotations, bars here are place to escape from the hustle and bustle of city life. Located in downtown, but with quiet, harmonious and natural atmosphere, Nanluoguxiang is where ancient culture and fashion could be so fit. This heavily renovated hutong is a heaven for backpackers. You can discover dozens of specialty stores at Nanluoguxiang, like those selling handicrafts and clothes. If you want to have a rest after an exhausting trip, you can walk into any cafe and order a simple meal or a pizza. Bus lines: Take bus 107,124,635, get off at Bao Chao Hutong stop to reach the north end of Nanluoguxiang; or take bus 118,13,60,612 to get off at Luoguxiang stop to reach the south end of Nanluoguxiang.